Water early in the day. Or water at night to minimize the water lost through evaporation. Also, the winds tend to be less in the early morning hours. Water deeply and thoroughly. Most plants tend to develop roots that spread through the soil to the depth where water, air and nutrients are available. Light watering does not encourage deep root growth, and because the soil dries from the top down, it requires more frequent watering. Eliminate runoff. One of the most basic strategies for eliminating runoff is to water accurately. Overspray onto paved surfaces contributes nothing to your landscape or to the conservation objective. Heavy clay soils or sloping lands can also lead to excessive runoff. To counteract these conditions, either change your design or water for several successive short intervals to allow the water to soak in. Use low-volume watering devices. If you already have an underground sprinkler system, you can increase its efficiency by changing the heads to a low-precipitation type head. Use matched precipitation rate heads to ensure even water application. Also convert as many zones as possible to drip zones with ultra-low volume heads. Change your watering schedules seasonally. Water demands will vary according to seasonal temperatures and seasonal precipitation patterns. Adjust your watering routines to account for cooler temperatures and current precipitation. Use an automated watering system. Monitoring water application with hose sprinklers to ensure even coverage and run times is a difficult task to accomplish with any degree of consistency. Accidentally leaving a sprinkler running overnight can waste thousands of gallons of water. Most people do not have the time required to accomplish the job in an acceptable manner. The use of an automatic electronic water controller can operate complex or simple watering routines exactly when and how long you want. This is especially helpful for summer vacations. The use of a drip irrigation system is one of the easiest ways to more precisely monitor the amount of water applied to your landscape. It is also one of the easiest systems to assemble and adjust. A drip system will deliver water at low pressure to specific areas or plants. Water penetration is slow and the depth of penetration is determined by the amount of time the system is run. A drip system can be added to an existing underground system, or it can be run directly from a hose bibb or the end of a hose. A key component of a drip system is the pressure regulator. 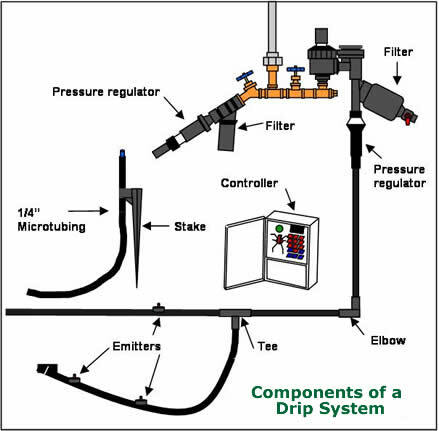 Most drip systems are designed to be operated between 20– 30 psi. Most household water lines may be much higher than this. The pressure regulator will reduce the pressure to a rate that the system can handle. Inexpensive automatic timers that attach directly to your hose bibbs are available through local hardware stores. The timers can be used for drip systems or for lawn sprinklers and may be programmed for four or more start times per day.